Russian navigation satellite. Tsikada was a complementary civilian version of the Parus military naval navigation satellite system for the Soviet Merchant Marine and Academy of Sciences. Navigation satellite built by NPO Prikladnoi Mekhaniki (NPO PM), Russia. Launched 1976 - 1995. Used KAUR-1 bus. AKA: 11F643. Status: Operational 1976. First Launch: 1976-12-15. Last Launch: 1995-07-05. Number: 20 . Gross mass: 820 kg (1,800 lb). Development began once flight test of Parus began in 1974, and deployment of the operational Tsikada system began in 1978. Development of this second generation Soviet navigation satellite system represented a collaboration between the Navy, Academy of Sciences, and Ministry of Shipping. The basis was the Parus / Tsiklon-B Doppler navigation system, but allowing asynchronous operation of on-board equipment with only essential equipment receiving a timer interrupt. Development began in 1974 with most preliminary work already accomplished under the military Parus program. Prime contractor was KBPM/Reshetnev. PO Polyot, A S Klinyshkov Chief Designer, provided synchronization equipment. NII Radiopribor under N Ye Ivanov provided cryptography and spacecraft navigation systems. Flight trials began in 1976 from Plesetsk under Admiral A I Rassokho. 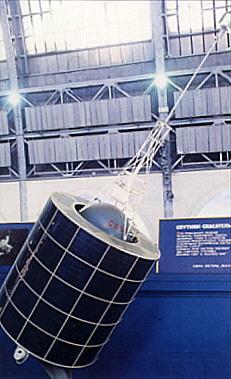 The launch of Kosmos 1000 on 31 March 1978 marked the beginning of deployment of the operational system. The system was accepted for military service in 1979 by the Soviet Army and VMF. The operational satellite constellation consisted of a minimum of four operational satellites, each deployed in one of four planes, spaced 45 degrees apart. Typical lifetime was 18 to 24 months. The signals were supplemented for military users by the very similar military Tsiklon-B/Parus system, which was in six planes 30 degrees apart. The satellites transmitted Doppler-shifted VHF transmissions at around 150 and 400 MHz of their position and orbital characteristics. The satellite could be launched one per Kosmos-3M or four per Tsyklon-3 booster. The Tsikada system provided global navigation for both the Soviet Navy and commercial shipping. Family: Medium earth orbit, Navigation. Country: Russia. Launch Vehicles: R-14, Kosmos 3, Kosmos 11K65M. Launch Sites: Plesetsk, Plesetsk LC132/2, Plesetsk LC132/1, Plesetsk LC133/3. Agency: MO, Reshetnev bureau. Bibliography: 102, 107, 2, 445, 449, 6, 6998, 13308, 13309. 1976 December 15 - . 14:00 GMT - . Launch Site: Plesetsk. Launch Complex: Plesetsk LC132/1. LV Family: R-14. Launch Vehicle: Kosmos 11K65M. Cosmos 883 - . Mass: 810 kg (1,780 lb). Nation: Russia. Agency: MO. Class: Navigation. Type: Navigation satellite. Spacecraft Bus: KAUR-1. Spacecraft: Tsikada. USAF Sat Cat: 9610 . COSPAR: 1976-122A. Apogee: 1,005 km (624 mi). Perigee: 955 km (593 mi). Inclination: 83.00 deg. Period: 104.70 min. Civilian naval navigation satellite..
1977 July 8 - . 17:30 GMT - . Launch Site: Plesetsk. Launch Complex: Plesetsk LC132/1. LV Family: R-14. Launch Vehicle: Kosmos 11K65M. Cosmos 926 - . Mass: 810 kg (1,780 lb). Nation: Russia. Agency: MO. Class: Navigation. Type: Navigation satellite. Spacecraft Bus: KAUR-1. Spacecraft: Tsikada. USAF Sat Cat: 10137 . COSPAR: 1977-062A. Apogee: 1,016 km (631 mi). Perigee: 969 km (602 mi). Inclination: 82.90 deg. Period: 105.00 min. Civilian naval navigation satellite..
1978 March 31 - . 14:01 GMT - . Launch Site: Plesetsk. Launch Complex: Plesetsk LC132/1. LV Family: R-14. Launch Vehicle: Kosmos 11K65M. Cosmos 1000 - . Mass: 810 kg (1,780 lb). Nation: Russia. Agency: MO. Class: Navigation. Type: Navigation satellite. Spacecraft Bus: KAUR-1. Spacecraft: Tsikada. USAF Sat Cat: 10776 . COSPAR: 1978-034A. Apogee: 1,008 km (626 mi). Perigee: 955 km (593 mi). Inclination: 82.90 deg. Period: 104.70 min. Civilian naval navigation satellite. Completion of work on a space navigation system designed to permit determination of the position of Soviet naval and fishing vessels..
1979 April 11 - . 21:51 GMT - . Launch Site: Plesetsk. Launch Complex: Plesetsk LC132/1. LV Family: R-14. Launch Vehicle: Kosmos 11K65M. Cosmos 1092 - . Mass: 810 kg (1,780 lb). Nation: Russia. Agency: MO. Class: Navigation. Type: Navigation satellite. Spacecraft Bus: KAUR-1. Spacecraft: Tsikada. USAF Sat Cat: 11326 . COSPAR: 1979-030A. Apogee: 1,005 km (624 mi). Perigee: 959 km (595 mi). Inclination: 83.00 deg. Period: 104.70 min. Civilian naval navigation satellite..
1980 March 17 - . 21:37 GMT - . Launch Site: Plesetsk. Launch Complex: Plesetsk LC132/1. LV Family: R-14. Launch Vehicle: Kosmos 11K65M. Cosmos 1168 - . Mass: 810 kg (1,780 lb). Nation: Russia. Agency: MO. Class: Navigation. Type: Navigation satellite. Spacecraft Bus: KAUR-1. Spacecraft: Tsikada. USAF Sat Cat: 11735 . COSPAR: 1980-022A. Apogee: 1,009 km (626 mi). Perigee: 958 km (595 mi). Inclination: 83.00 deg. Period: 104.80 min. Civilian naval navigation satellite..
1980 December 10 - . 20:53 GMT - . Launch Site: Plesetsk. Launch Complex: Plesetsk LC132/1. LV Family: R-14. Launch Vehicle: Kosmos 11K65M. Cosmos 1226 - . Mass: 680 kg (1,490 lb). Nation: Russia. Agency: MO. Class: Navigation. Type: Navigation satellite. Spacecraft Bus: KAUR-1. Spacecraft: Tsikada. USAF Sat Cat: 12091 . COSPAR: 1980-099A. Apogee: 1,009 km (626 mi). Perigee: 960 km (590 mi). Inclination: 82.90 deg. Period: 104.80 min. Civilian naval navigation satellite..
1981 September 4 - . 11:06 GMT - . Launch Site: Plesetsk. Launch Complex: Plesetsk LC132/1. LV Family: R-14. Launch Vehicle: Kosmos 11K65M. Cosmos 1304 - . Mass: 810 kg (1,780 lb). Nation: Russia. Agency: MO. Class: Navigation. Type: Navigation satellite. Spacecraft Bus: KAUR-1. Spacecraft: Tsikada. USAF Sat Cat: 12803 . COSPAR: 1981-087A. Apogee: 972 km (603 mi). Perigee: 906 km (562 mi). Inclination: 82.90 deg. Period: 103.80 min. Civilian naval navigation satellite; replaced Cosmos 926..
1982 February 17 - . 21:56 GMT - . Launch Site: Plesetsk. Launch Complex: Plesetsk LC132/2. LV Family: R-14. Launch Vehicle: Kosmos 11K65M. Cosmos 1339 - . Mass: 810 kg (1,780 lb). Nation: Russia. Agency: MO. Class: Navigation. Type: Navigation satellite. Spacecraft Bus: KAUR-1. Spacecraft: Tsikada. USAF Sat Cat: 13065 . COSPAR: 1982-012A. Apogee: 1,014 km (630 mi). Perigee: 948 km (589 mi). Inclination: 82.90 deg. Period: 104.70 min. Civilian naval navigation satellite. Replaced Cosmos 1092..
1983 October 26 - . 17:20 GMT - . Launch Site: Plesetsk. Launch Complex: Plesetsk LC132/1. LV Family: R-14. Launch Vehicle: Kosmos 11K65M. Cosmos 1506 - . Mass: 810 kg (1,780 lb). Nation: Russia. Agency: MO. Class: Navigation. Type: Navigation satellite. Spacecraft Bus: KAUR-1. Spacecraft: Tsikada. USAF Sat Cat: 14450 . COSPAR: 1983-108A. Apogee: 1,011 km (628 mi). Perigee: 947 km (588 mi). Inclination: 82.90 deg. Period: 104.70 min. Civilian naval navigation satellite. Replaced Cosmos 1304..
1984 May 17 - . 14:43 GMT - . Launch Site: Plesetsk. Launch Complex: Plesetsk LC132/1. LV Family: R-14. Launch Vehicle: Kosmos 11K65M. Cosmos 1553 - . Mass: 810 kg (1,780 lb). Nation: Russia. Agency: MO. Class: Navigation. Type: Navigation satellite. Spacecraft Bus: KAUR-1. Spacecraft: Tsikada. USAF Sat Cat: 14973 . COSPAR: 1984-046A. Apogee: 1,005 km (624 mi). Perigee: 960 km (590 mi). Inclination: 82.90 deg. Period: 104.70 min. Civilian naval navigation satellite. Replaced Cosmos 1383..
1985 May 30 - . 01:14 GMT - . Launch Site: Plesetsk. Launch Complex: Plesetsk LC132/1. LV Family: R-14. Launch Vehicle: Kosmos 11K65M. Cosmos 1655 - . Mass: 810 kg (1,780 lb). Nation: Russia. Agency: MO. Class: Navigation. Type: Navigation satellite. Spacecraft Bus: KAUR-1. Spacecraft: Tsikada. USAF Sat Cat: 15751 . COSPAR: 1985-041A. Apogee: 1,013 km (629 mi). Perigee: 976 km (606 mi). Inclination: 83.00 deg. Period: 105.00 min. Civilian naval navigation satellite. Replaced Cosmos 1447..
1986 January 23 - . 18:52 GMT - . Launch Site: Plesetsk. Launch Complex: Plesetsk LC132/1. LV Family: R-14. Launch Vehicle: Kosmos 11K65M. Cosmos 1727 - . Mass: 810 kg (1,780 lb). Nation: Russia. Agency: MO. Class: Navigation. Type: Navigation satellite. Spacecraft Bus: KAUR-1. Spacecraft: Tsikada. USAF Sat Cat: 16510 . COSPAR: 1986-008A. Apogee: 1,014 km (630 mi). Perigee: 957 km (594 mi). Inclination: 83.00 deg. Period: 104.80 min. Civilian naval navigation satellite. Replaced Cosmos 1506..
1986 November 13 - . 06:10 GMT - . Launch Site: Plesetsk. Launch Complex: Plesetsk LC132/2. LV Family: R-14. Launch Vehicle: Kosmos 11K65M. Cosmos 1791 - . Payload: Tsikada. Mass: 810 kg (1,780 lb). Nation: Russia. Agency: MO. Class: Navigation. Type: Navigation satellite. Spacecraft Bus: KAUR-1. Spacecraft: Tsikada. USAF Sat Cat: 17066 . COSPAR: 1986-086A. Apogee: 1,010 km (620 mi). Perigee: 951 km (590 mi). Inclination: 83.00 deg. Period: 104.70 min. Replaced Cosmos 1553. Civilian navigation satellite. Positioned in plane 11 of constellation..
1987 January 29 - . 06:14 GMT - . Launch Site: Plesetsk. Launch Complex: Plesetsk LC132/2. LV Family: R-14. Launch Vehicle: Kosmos 11K65M. Cosmos 1816 - . Mass: 810 kg (1,780 lb). Nation: Russia. Agency: MO. Class: Navigation. Type: Navigation satellite. Spacecraft Bus: KAUR-1. Spacecraft: Tsikada. USAF Sat Cat: 17359 . COSPAR: 1987-009A. Apogee: 1,010 km (620 mi). Perigee: 960 km (590 mi). Inclination: 82.90 deg. Period: 104.80 min. Civilian naval navigation satellite..
1987 June 23 - . 07:37 GMT - . Launch Site: Plesetsk. Launch Complex: Plesetsk LC132/1. LV Family: R-14. Launch Vehicle: Kosmos 11K65M. Cosmos 1861 - . Payload: Tsikada/RS-10/RS-11. Mass: 810 kg (1,780 lb). Nation: Russia. Agency: MO. Class: Navigation. Type: Navigation satellite. Spacecraft Bus: KAUR-1. Spacecraft: Tsikada. USAF Sat Cat: 18129 . COSPAR: 1987-054A. Apogee: 999 km (620 mi). Perigee: 981 km (609 mi). Inclination: 82.90 deg. Period: 104.90 min. Location of vessels in the Soviet merchant marine and shipping fleet anywhere at sea; facilitation of amateur radio communication and conduct of experiments for scientific and educational purposes. .
1991 February 5 - . 02:36 GMT - . Launch Site: Plesetsk. Launch Complex: Plesetsk LC133/3. LV Family: R-14. Launch Vehicle: Kosmos 11K65M. Cosmos 2123 - . Payload: Tsikada/RS-12/RS-13. Mass: 810 kg (1,780 lb). Nation: Russia. Agency: MO. Class: Navigation. Type: Navigation satellite. Spacecraft Bus: KAUR-1. Spacecraft: Tsikada. USAF Sat Cat: 21089 . COSPAR: 1991-007A. Apogee: 1,005 km (624 mi). Perigee: 963 km (598 mi). Inclination: 82.90 deg. Period: 104.80 min. Civilian navigation satellite. Positioned in plane 13 of constellation. Testing of components and equipment of a space navigation system being set up to determine the position of civil aircraft and ships of the USSR merchant marine and fishing fleet at any point on the oceans and seas. Two amateur satellite transponders, RS12 and RS13, were secondary payloads on the Cosmos 2123 navigation satellite. These transponders were developed at the Kaluga Electromechanical Plant under the direction of Aleksander Papkov and were launched aboard several satellites by the USSR during 1978-1991. 1992 March 9 - . 22:35 GMT - . Launch Site: Plesetsk. Launch Complex: Plesetsk LC132/1. LV Family: R-14. Launch Vehicle: Kosmos 11K65M. Cosmos 2181 - . Payload: Tsikada. Mass: 825 kg (1,818 lb). Nation: Russia. Agency: MO. Class: Navigation. Type: Navigation satellite. Spacecraft Bus: KAUR-1. Spacecraft: Tsikada. USAF Sat Cat: 21902 . COSPAR: 1992-012A. Apogee: 1,012 km (628 mi). Perigee: 972 km (603 mi). Inclination: 82.90 deg. Period: 105.00 min. Civilian navigation satellite. Positioned in plane 11 of constellation. Tsikada type spacecraft. Determination of the position of ships of the merchant marine and fishing fleet in the world's oceans and seas as part of the Tsikada space navigation system..
1993 January 12 - . 11:10 GMT - . Launch Site: Plesetsk. Launch Complex: Plesetsk LC133/3. LV Family: R-14. Launch Vehicle: Kosmos 11K65M. Cosmos 2230 - . Payload: Tsikada. Mass: 825 kg (1,818 lb). Nation: Russia. Agency: MO. Class: Navigation. Type: Navigation satellite. Spacecraft Bus: KAUR-1. Spacecraft: Tsikada. USAF Sat Cat: 22307 . COSPAR: 1993-001A. Apogee: 1,008 km (626 mi). Perigee: 969 km (602 mi). Inclination: 82.90 deg. Period: 104.90 min. Civilian navigation satellite. Positioned in plane 11 of constellation. TSIKADA type spacecraft. Determination of the position of ships of the merchant marine and fishing fleet in the world's oceans and seas as part of the Tsikada space navigation system..
1995 January 24 - . 03:54 GMT - . Launch Site: Plesetsk. Launch Complex: Plesetsk LC132/1. LV Family: R-14. Launch Vehicle: Kosmos 11K65M. Tsikada - . Mass: 825 kg (1,818 lb). Nation: Russia. Agency: MO. Class: Navigation. Type: Navigation satellite. Spacecraft Bus: KAUR-1. Spacecraft: Tsikada. USAF Sat Cat: 23463 . COSPAR: 1995-002A. Apogee: 1,020 km (630 mi). Perigee: 964 km (599 mi). Inclination: 82.90 deg. Period: 105.00 min. Civilian navigation satellite. Positioned in plane 13 of constellation. Maritime navigation. Signals at 150.00 MHz and 400.00 MHz..
1995 July 5 - . 03:09 GMT - . Launch Site: Plesetsk. Launch Complex: Plesetsk LC132/1. LV Family: R-14. Launch Vehicle: Kosmos 11K65M. Cosmos 2315 - . Payload: Tsikada. Mass: 825 kg (1,818 lb). Nation: Russia. Agency: MO. Class: Navigation. Type: Navigation satellite. Spacecraft Bus: KAUR-1. Spacecraft: Tsikada. USAF Sat Cat: 23603 . COSPAR: 1995-032A. Apogee: 1,013 km (629 mi). Perigee: 970 km (600 mi). Inclination: 82.90 deg. Period: 104.90 min. Civilian navigation satellite. Positioned in plane 11 of constellation. Signals at 150.,00 MHz and 400.00 MHz..